For over 70 years, Tri-Boro has been dedicated to providing companies with innovative solutions, equipment and programs for all their storage requirements. SPECIALTY RACKS • AND MUCH MORE! From the largest to the smallest of jobs, our production, warehousing/shipping and customer service departments insure that your order will be delivered on time. 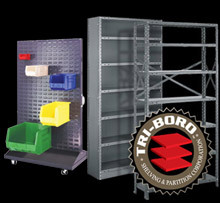 All Tri-Boro products are manufactured in accordance with the highest quality standard of the material handling industry.